Less demanding than the Power One and recommended for skill improvement, along with groomer cruising, even at fairly high speed. Is it actually "perfect?" Probably not, but it's close for the right kind of skier.? (115-67-99)? If anyone happens to see a great deal on this (or a similar) ski in 156 length, let me (or her) know.? I think the key in the above summary is the narrow waist, relatively soft flex for the level of performance, and the assertion that its a recommended ski for skill improvement along with high speed groomer cruising.? Her "greed for speed" has increased quite a bit in the past couple of years, but she is also always doing PMTS drills. Glad you caught it. I had you in mind when I chose the word. Jim, did you pm the deal-master? Wonder if he has a short pair of RX 70's? But you have to understand that I'm enamored of the concept of getting "the Perfect One for the perfect one"!! And sorry guys, the system doesn't have a gagging icon? Looking for a deal like I got on the Maunga's, $100 still in the shrink wrap (and I think Svend bought the pair for his daughter from the same place). Jim, yes I did get the Fischer Maunga for our daughter -- great ski! She had a blast on it this winter, and the 85mm waist was money when we hit the 36 inch dump at Whiteface.? Agile, fun, stable, great build quality...and such a deal!? As for the Perfect One, I can check our local shop for you when I get back from my travels (I am in Alberta at the moment, near Banff again, and will ski Sunshine Mtn. this weekend? ).? They sell a lot of Head, and have good deals.? I know they have the Power One, but I don't remember seeing the Perfect One -- I'll get back to you next week. Are you dead-set on that ski? Or are you open to other recommendations? If so, you might check with Terryl by email and get her feedback.? She skis the '07 Supershape Speed, which is exactly the same ski as the present Power One except for graphics (confirmed by the Head Canada race tech rep).? She LOVES those skis! They are her Go-To skis when she really wants to put some mustard on it and really fly. Also.....she now has a pair of Fischer Progressor 8's (provided by a dear friend who shall remain nameless ), which are also a ton of fun.? Super light, quick and agile feeling underfoot.? More quick and snappy than the Speeds.? Definitely don't feel like 72mm underfoot (according to Terryl). Drop her a line if you want her two-bits worth. Not dead set on Perfect Ones, but a ski like that.? Yes, the Power One is like the supershapes, the Perfect One is like the TT line that JBotti (and Todd) wrote up earlier.? At times Lynn borders on wanting to go back to her iC160's because they were so good for learning and doing PMTS tipping drills, etc.? However, they had a top end.? The EveryThangs do very well at all of her skiing, but are stiffer than she would like for the various and sundry skill improvement drills.? We are attracted by the description of the ski as "great for skill improvement" while still capable of higher speed groomer cruising.? And the softer flex would also facilitate bumps, which is another area that draws Lynn like flies to honey. Definitely open to suggestions of other skis that have that softer feel but still up to an occasional burst of speed (and the bursts are infrequent).? Maybe an instructors ski would be in the same category, something that can be used when doing slow stuff with the class but still capable of some faster skiing.? 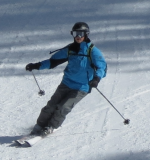 I think most instructiors don't teach on their free skiing skis. Hmmmm....very interesting.....? Well, you should definitely ask Terryl about the Progressors, sp. whether they would be of an appropriate stiffness for Lynn's weight.? Terryl finds them to be a ton of fun.? The dual radius sidecut is similar to the TT that John and Todd described, making turn release very controllable and smooth.? I can attest, having skied the Progressor 9 -- it was the most versatile hard snow ski I have been on; I could seemingly do anything I wanted, and the ski handled it all with aplomb.? I think you are on the right track -- that kind of sidecut really works. Elan Speedwave 10:? http://www.elanskis.com/pcc.asp#xpath=/products/product#xpathid=Speedwave10#lang=cae? I have checked these out as a possible choice for Terryl -- they seem soft but not noodly; torsionally stiff from the Waveflex design; no metal; very well made. A little wider than what you are looking for, perhaps....? Nordica Firefox:? female version of the Spitfire, but softer.? Gets rave reviews in the media and forums (Ski Diva).? Supposed to very quick, agile, stable.? Good looking ski, too.? But too stiff for a lightweight? Nordica puts it in their "race" category, which might be a good indicator.